Have I mentioned that I like long wings? No? Well, I like long wings. And I like lists. Lists help me organize information. 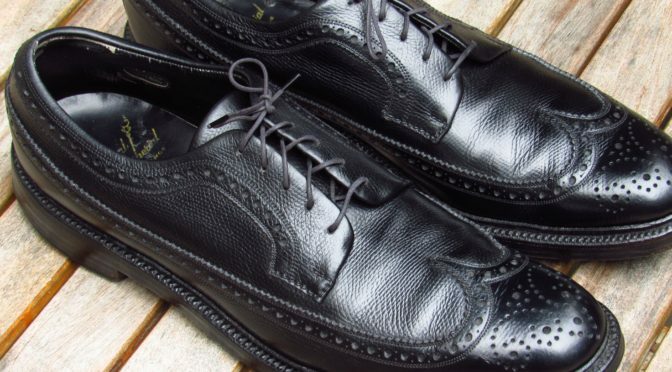 And this list of Florsheim long wings should help you as well. For this list, I focused solely on Made in USA long wings manufactured during the Cold War era and made from cattle skin leather. No Shell Cordovan or exotic leather models are listed. 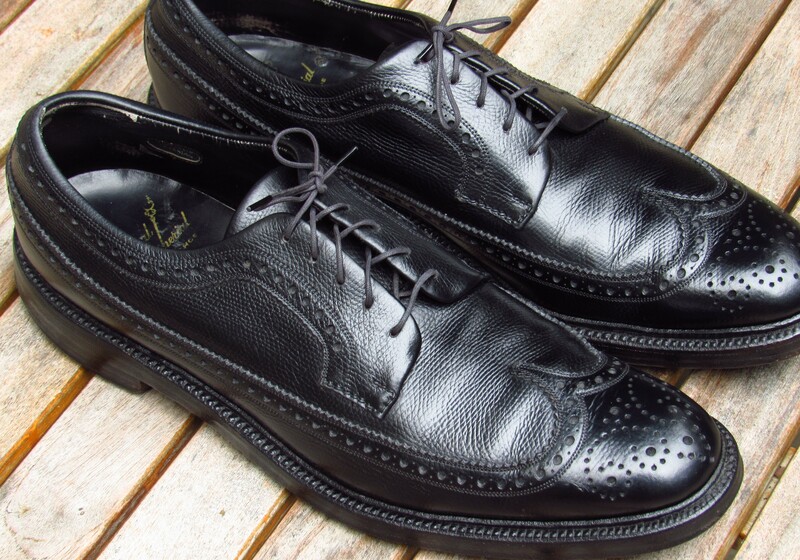 For Shell, read my post on Florsheim’s Shell Cordovan modals. And to keep this list a reasonable length I also excluded a few other types of models: long wing spectators; custom models; and the 70000 series of models. 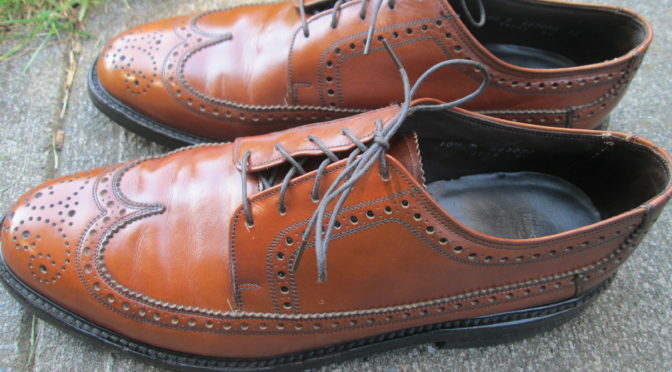 Where can you find the model number for a pair of Florsheim shoes? Read this post. This list not complete. There are likely a couple more models out there. But this list includes models seen on eBay in the past couple years. The shoes on the list are categorized by product line: Florsheim Imperial; Florsheim Royal Imperial; and Florsheim Blue Label. If you have more information, better photos, or catalog scans – send me an email via the contact link. Thanks! Notes: Made from 1965 to 1979. Read more about this shoe in this post. Additional details on this model in this post. Notes: 1990’s model. Hide your eyes on this pair. Notes: 1989-2002. Early 90s models are excellent shoes. In 1996, was rebadged as an Imperial. Notes: 1960/70s model. 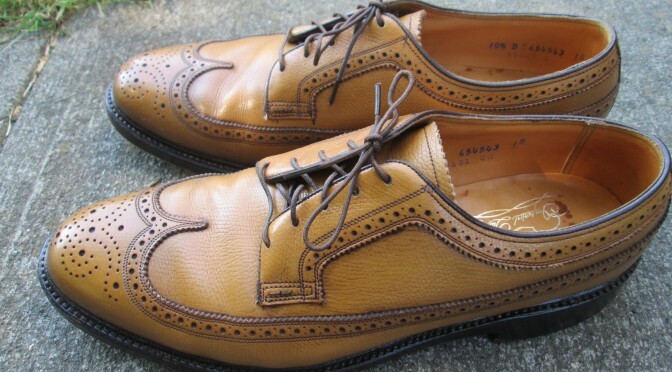 One of the best Florsheim shoes. Read more about this shoe in this post. Notes: 1990s model. 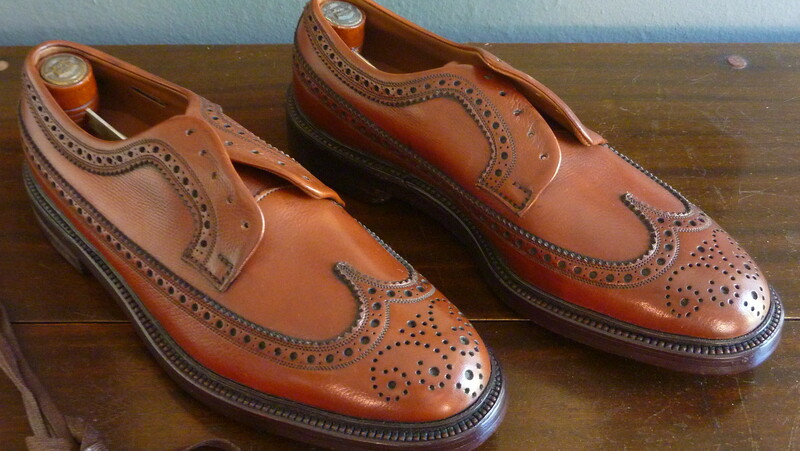 Beware – NOS pairs look like Shell but they not Shell Cordovan. Made from a glossy, polished cobbler leather. Notes: Produced from 1965 to 1976 or 1977. Also called Kenmoor. Notes: 1990s model. Terrible bonded leather. Avoid. Notes: 1960s model. Read more about this model in this post. Notes: Produced from 1965 to early-1970s. Also named the Kenmoor. Read more about this model in this post. See this post for more photos of this model. Should we assume that models not listed as “corrected” or “binder leather” are made with FULL grain uppers? Also, is it fair to say that Royal Imperial > Imperial > Blue Line in terms of quality and construction? Thanks, and carry on the great work you’ve been doing. In general – yes. Some of the 1960s Imperials were better than 1990s Royal Imperials. 1950s Blue Line were top quality shoes. For the leather question, I wrote the type of leather if I had info on it. The 30831 and 20819 look like corrected leather to me. I found myself a pair of Kenmoors in what looks like Coventry Calf, but the oddest thing about them is they don’t have a model number. Ever come across that before? And I’ve got an interesting-ish story about the Golden Harvest, the 93631. On a whim about five years ago, I bought a pair of Kenmoors off of eBay. The heathen who was selling them had spray painted them (for some reason) with an orange Meltonian shoe coloring and was touting them as looking pretty good. When I got them, I was speechless. I couldn’t live with a pair of shoes in my closet that looked like a grade school art project, so, I decided to strip off all the paint. They came out looking not too terrible, so I decided to keep them. Only recently–say, a month ago–did I learn that they were, in fact, a pair of Golden Harvests. They’ve lost quite a bit in color after the stripping. Anything I can do to help get that color back? They’ve been conditioned probably half a dozen times already with an all-natural shoe cream I like to use. Its a tough color to restore since the color is so light. Its much easier to fix up a darker pair. Black is the easiest. I struggled with another pair of golden harvest that was in rough shape and finally gave up. They always looked like flithy old shoes. Sorry. Hi David , love your blog and have learned so much . I bought #30813 on ebay . They dont appear to be storm welted . Do you lnow if they are goodyear welted ? They have no country of origin and appear like new . The insole has the heel florsheim badge . But in front of that under the toebox to the arch looks kinda bare , as if its missing the underfoot front of the insole covering . They’re so pristine , it’s hard to imagine anything was removed from the inside . The date code is “CH” . Is therr any info you may have . I just like to know . I believe those were made in the 1970s. They are almost certainly goodyear welted. Most vintage Florsheim shoes have a heel pad, the insole isn’t fully covered. Hope that helps. It helps very much . Thank you . Wore them yesterday . They crease a bit on the vamp as they are a bit long . My feet felt fine , and I felt sharp . Thank you for your reply , and for awakening in me a deep appreciation for shoes that “the greatest generation” wore . God Bless . David I’m sorry I have another “rookie” question …What type of alcohol to clean the interior . Is it isopropyl or butyl or are the interchangeable . Also, is there any other tips you might recommend to “freshen” the interiors of a used pair of shoes ? Thank you . I generally use 70% isopropyl alcohol. Then follow that with a UV treatment. Sometimes I will condition the inside of the shoe with lexol. Wow ! Great ! Thank you . I love the watchlist as well !!! David, what’s your opinion on 31881? Construction? Are they made in US? Full grain leather? GYW? Do they run similar to 93602, 93605? David, can you tell me if there is any real difference between the 92604 Kenmore and the 96624 Kenmore (other than the year they were made)? I now own a pair of 93602 Kenmore’s, but now need these shoes in black. Nowhere can I find info on Royal Imperial 97318, certainly not for lack of trying. Any insight, any at all, would be appreciated! The 97318 is a wing tip called the Park. It was made in the 80s and 90s. The soles are not goodyear welted. Thank you so much! I’m in awe. Not the best shoe Florsheim ever made, I’m guessing (and here I thought Royal Imperials were the top of the line, yet couldn’t figure out why the leather seems so…cheap). Thanks again for the info! I don’t have any catalogs that mention the 70000 series shoes. My guess is that they were sold through a channel outside the Florsheim stores in the 90s. Many of them are almost identical to the models in the regular line but usually with lower quality construction. I haven’t seen a worn 76592 so I am not sure if it is corrected leather or not. Thanks so much for all of the information and for the quick response! Need help identifying this model. Brown leather, model 75825 IC. Were all of the 70000 models made in India? I don’t believe they were made in India. I just got my hands on a 30813 model. Just wanted to ask is it corrected grain or full grain? Would you have any idea? I tried googling but not able to find anything on this. Its made from “Cortez leather”. Not sure what that is but it might be top grain leather. David, I have a pair of Worthmore wingtips which are in amazing condition. I stopped wearing them decades ago and believe the heels and soles to be original . I’d be happy to email photos. The top row reads 10 1/2C 3216 9 11 (or 9H?). The bottom reads 9F(or 96, 9B, 9R?) 7337 WP H9 (or 119?) Can they really be from August of 1959? Any marketing advice and / or recommendations would be greatly appreciated. Any idea on the 76400 long wing? Looks like a 1990s logo and possibly made in India? Corrected grain? Definitely made in India. I don’t have much else. 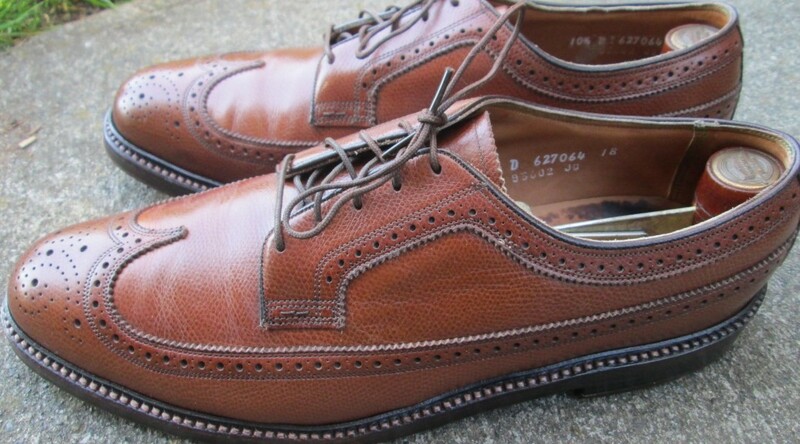 Any info on long-wing green label Imperials single sole six eyelet models? I have a pair of Royal Imperials with model #97336 or 97335, possibly 97835/6 or 97385/6. Do you happen to have any information on the shoe? They are double soled with a storm welt and brown/cognac pebbled/hatch grain, more than likely bookbinder unfortunately. Appreciate any information you could provide. I don’t recognize those numbers. Send me a few photos. My email is on the contact page.